Do you have a problem with standing water? The BLOTTER machines have been designed to solve YOUR water problems! 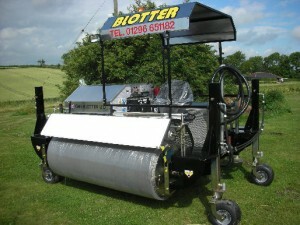 BLOTTERS and Super Mini Rollers can be used on may surfaces, including Football Pitches, Cricket Outfields, Squares, Golf Greens, Fairways and Race Courses. This machine can also be used to clear water from Pathways, Car parks and Bunkers! We are pleased to present to you our range of Premium professional water removal systems. These systems have been developed over a number of years in conjunction with many of the United Kingdoms premier sporting venues. Our twenty years targeted experience in this field coupled with extensive knowledge of the pressures of provision of first class sporting facilities “come what may” guarantee to keep your venue operating. We offer a variety of systems tailored to most budgets and requirements with a range of capital finance solutions targeted to your specific needs. See how well our systems deal with a water logged area.